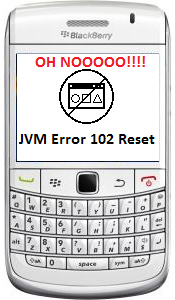 JVM Error 102 on your BlackBerry? Try this solution BEFORE wiping! So as I was getting ready to hit the sack last night, I decided to give my 9930 a battery pull. It had been a bit sluggish for the last hour and I figured it couldn't hurt right? I was wrong. I set my BlackBerry down while it rebooted and went to turn off the hall light. When I came back, my beloved BlackBerry was showing me the white screen of death. I hadn't installed or deleted any apps in the last day so I was completely at a loss as to what had happened. I broke out into a cold sweat, my entire life is on that thing! Of course I hadn't backed up my device in over 2 weeks (this would've never happened if I regularly backed it up I'm sure). It was almost midnight and I had pretty much resigned myself to a long night of reinstalling when I recalled seeing something on the net about not having to wipe your device when given error 102. I trotted downstairs to my laptop and whipped out my trusty USB cable. Within half an hour, my 9930 was back up and running, no wipe or reinstall needed. Keep reading to find out how. Basically the error message 102 is a .cod file that has been corrupted. 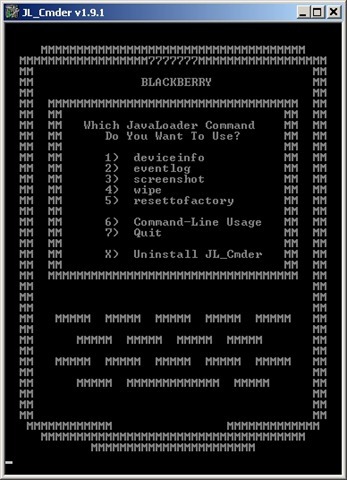 Your BlackBerry, being the smart phone that it is (pun intended), refuses to load the corrupted file. To possibly, and I do mean possibly since this option may not always work, you will need JL_Cmder installed on your computer (grab a copy here and install it . Make sure you install it into the Program Files on your C: drive. Make a mental note of whatever you saved it as since you will need the exact name you gave it), a USB cable and of course your seemingly lifeless BlackBerry. Run JL_Cmder and select Option #2 - Event Log. It may take a few tries to get the software to open (no clue why, but if someone does know, feel free to enlighten us in the comments below). On your computer, go to Start > Run, and type "cmd" then press the enter key. Disconnect your phone from your PC and restart it. Presto! Your BlackBerry should boot up like normal and you can then go make a backup in case it happens again. Mine seems to have fixed itself and is running great. The only thing I noticed after the reboot was my BBM icon was missing. According to the device the application was still on there but I couldn't locate it. I reinstalled and everything is golden now. Hope this helps some of you out like it did me.